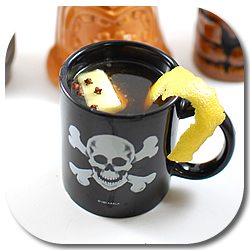 Hot Buttered Rum is a frequent holiday drink that frequently finds itself at the business end of tinkering. 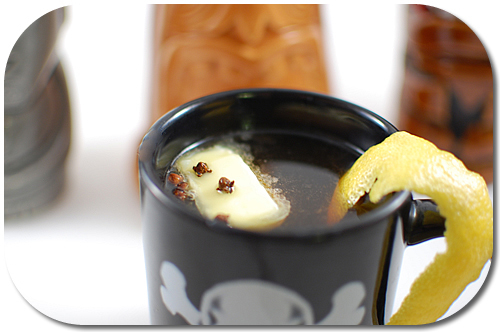 In a recent post I discussed the essential or basic Hot Buttered Rum, a simple mixture of rum, butter, hot water, sugar, and spices. Any drink that exists as long as Hot Buttered Rum is bound to be tweaked and modified and turned into other drinks, and Jeff “Beachbum” Berry turned me on to this particular variation. Place juice, sugar, maraschino, and rum into a pre-heated mug. Add hot tea. Stir and then float the butter. Garnish with lemon peel and cloves. This recipe hearkens from the 1950’s, when Bob Ida of the Volcano House Hotel on the Big Island of Hawaii bestowed it upon the world. I had asked a group of mixologists for some of their favorite winter rum drinks, and Jeff was nice enough to share this recipe, which will be appearing in his upcoming book, Beach Bum Berry Remixed . If you’re unfamiliar with The Bum, you should definitely take the time to go and hunt down his other books . Every one is chock-full of great recipes and the history behind some of the best Tiki drinks ever concocted by concoctioneers that were busy concocting their crazy concoctions. This particular recipe is, quite frankly, butterly delicious. With the right rum this drink is both sweet and earthy, with the richness of the butter making it truly something to savor. If you have access to a great Jamaican or Demerara rum, I recommend using one of those, preferably over and over again until the bottle is empty. *Daytime high 28 today with flurries. I just picked up a bottle of Smith & Cross Jamaican pot still rum that I will be subbing for the normal Coruba that I use in this recipe. As a bonus, it’s been unusually cold lately in San Francisco. I think it dropped down into the 50’s last night. Have you tried using different sugar subs, such as honey, or better yet, molasses? Might be interesting to get a real hot Black Strap flavor coming out of there. I’ll admit, Maraschino liqueur does not sound at all good heated, but I’ll try (almost) anything once! Quite the citrus kick indeed! Very good! Brewed a pot of chai with added ginger, pepper, star anise and assorted citrus peels. Great spicy base for the butter and our San Diego local Ballast Point rum!